Omega Xl - Very expensive product. And they want to put you on auto pay immediately. Jun 26, 2015 Thank you for your feedback. We have hundreds of satisfied monthly customers who have purchased our product as a result of Larry King. Our patented oil- known as PCSO-524- is harvested from the green lipped mussel from the pure waters of New Zealand. The mussels are grown for approximately 18 months and very sophisticated technology is used to produce the oil in one tiny capsule of Omega XL. Over 30 years of published clinical research undertaken at major universities worldwide supports PCSO-524 and consumers have experienced positive health benefits from our product. It takes between 8 to 14 mussels per capsule depending on the size of the mussels. It is expensive to produce our product and those customers that agree to monthly autoship receive a price reduction due to the reduced cost associated with this program. Customers may cancel at any time under this program and receive a full refund in the first 90 days from initial purchase. We also train our agents to disclose all terms of our offer prior to processing any transaction. 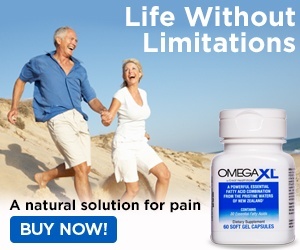 In your instance, we do offer the right to purchase the product without a monthly autoship and encourage you to contact our customer service center should you be interested in trying Omega XL on that basis. When I called to order after seeing the Larry King infomercial and allegedly all of these actual users verifying the product I was asked for my credit card number before I was even told what the price was. Then I was told after I had given my credit card information that in order to get the two for one price I had to agree to autopay where I would get a new shipment every 30 or 60 days. I told the gentleman I certainly did not want to go on any automatic shipment plan prior to even knowing whether or not this product would help me. The product runs about $70 for one bottle per month which i think is very exhorbitant. I decided not to order. Review #583635 is a subjective opinion of User583635. Just sent a similar complaint about omega xl. Really they also wanted automatic deduction from my credit card with out even trying the product. Plus, there must be reason why the info commercial with the so called famous Larry King never mentioned the price.